Behind every great writer is a great editor—so goes the maxim that writers abhor and publishers adore. The struggle between writer and publisher is as long and fraught as the history of print itself. 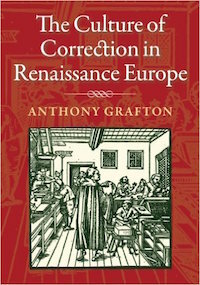 As distinguished historian Anthony Grafton reveals in The Culture of Correction, even during the Renaissance authors fumed and cursed over what became of their work in the printing house as it was prepared for publication. In this engaging study, Grafton re-creates the practices of professional correctors in the early printing workshops—the “poor devils” of literature whose work extended far beyond the specific task of proof correction—and the authors and printers alongside them. He pays particular attention to surviving manuscripts and the printed books that correctors used in order to explore what the traces they left behind can tell us about authorship and the role of the publisher in Renaissance Europe. This highly illustrated book represents the most groundbreaking research in the growing area of scholarship on the history of the book.